The indoor gym at Upper Noe Recreation Center has scheduled programming and open gym hours. Please refer to the updated hours in the lefthand column for open gym or the Daily Schedule for a full list of activities. 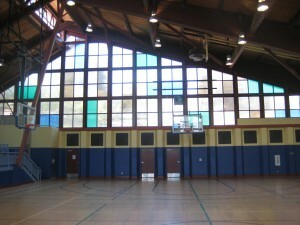 Upper Noe Recreation Center also houses a tennis court, an outdoor basketball court, and an athletic field with a baseball diamond. These are often open for free play and use. The athletic field is formally for use by Rec & Park for their programs, or to the public by reservation for athletic programs. Otherwise, it is usually available to the public for casual use such as Frisbee, family games, or to kick around a soccer ball or toss a football. 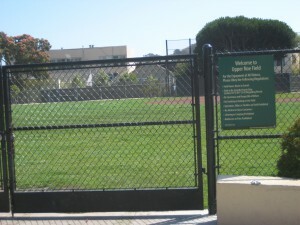 In good weather, when the park is open, the athletic field gates should be open as well. If necessary, ask the staff in the office to open the gates. (posted Dec 16, 2014) Currently the field is not available for rental and no activities on it are scheduled because is too wet to use. This is generally the case with natural grass fields from December through February. In addition, the gardeners are in the process of restoring this field. They hope to have it in great shape for spring baseball. 1) The baseball field is for players ages 12 and under. It is not regulation size and even teens can hit a hardball out of this park. Foul balls over the first base line endanger people in the dog run. 2) In general, the baseball diamond area is reserved for children’s league play. Rec & Park discourages any other use there to ensure that it stays playable for the kids. 3) Adult team activity is not appropriate on any part of the athletic field. The weight of adults turning hard quickly degrades the turf. Cleats are forbidden. 4) Fires or barbecues are strictly forbidden in all parts of the park including the athletic field. 5) No dogs are allowed on the athletic field at any time. Please do not hesitate to remind dog owners of this policy. To rent the gym or athletic field, please visit the department’s permits page here or contact the reservations center at 415-831-5500.